I don't think you'd have a problem with the phone co., but I've heard that PBX can be a different type of circuit than the phone line. You might want to check into this before you connect anything to your PBX and cause a problem for yourself. I was wondering if I could drive both chips with one crystal. I didn't try it because during the build I had a lot of variables to deal with! So that's good to know. Thanks for your comments. I was just wondering if it is possible to use an arduino (Uno) with DAA as a door phone (two way audio) which connects to FXS port of asterisk ? You should have found all the schematics and source code that I have linked in the post above. I should have provided everything to go as far as I took the project. It is what it is. After that it's up to you to adapt it to your needs. or would it be better to stick an opto coupler on the ring to measure the current going through the line if a call is in progress? It's been a long time since I messed with this, but the DAA has an ON HOOK signal line that maybe you can use and let the Arduino measure the time. If it were me I'd look at the schematic and example sketch and probably take a shot at it. i would then like to ring the internal phone after the correct tone was received (using it in conjunction with EasyVR to filter phone calls that people don't correctly call ..... probably i need to stack these boards and put the DAA on top of some empty shield with industrial glue for my application. i am most curious about the power on the line, during our recent blackout due to hurricane Sandy the only power into our phone was the still working landline. If i could have hooked a few bright leds to it we would have had some light too. When I lived in Arkansas and before we had power I was thinking of getting a little energy from the phone line. IIRC it's ~50V. With a buck regulator it might be used to light LEDs and charge batteries. The design is open source - help yourself. Is it possible to wire the dtmf's directly to the phone line? If you mean without a DAA that is covered above. In short, it's illegal, you get flaky results, and I don't support it. You are on your own there. Includes DAA, dtmf, all the good stuff, upgraded modules include voice record/playback and speakerphone I/O...basically everything you want to do, and it's an approved device. I'm pretty sure adding an arduino doesn't compromise that. I mean, adding a computer to your faxmodem doesn't invalidate it's fcc compliance. Hello. It is an excellent post. I have a question, what would it take if I wanted to transmit and receive voice through the DAA? Like a real telephone? Is it as simple as sending analog data to the TX line of the DAA and reading analog data from the RX line of the DAA??? Hello could you send me a schematic to make the link with the Arduino, I learned to make this connection with the pins of the arduino right. All I have is in this post. If you look at the the example sketches (GPIO or no GPIO) you will see the Arduino pins defined that go to the pins in the schematic. That's all I remember from 4 years ago. Hope it helps. Would VOIP get around the legality issues? Then there is no "phone line" to connect to--you'd be connecting to the VOIP modem. I would think so, it's not a Telco line, but I don't know for sure. Also not sure if you would run other issues with VOIP. This is a great circuit and I bought all of the parts and put it together (without the GPIO). The dialer and message functions work, but I can't get the receiver to work. I noticed after I wired everything up, I was left with "DV" (pin 15 from the receiver) and the capacitors that on the schematic are labeled to go to #1 and #2 on JP1. I couldn't find "DV" or the capacitors anywhere in the code. I have a mock phone line made of a 9v battery it seems to be working fine. I also skipped F1, F2, and V1. Thanks for any help! Sorry, it's been a long 5 years. The receiver datasheet reminded me that DV is "valid data". My guess is that it triggers the interrupt. Sir, Have you worked on an autoanswer/ auto off hook circuit? Sorry, no. I haven't touched this project in 6 years. monitor/activate/deactivate my alarm system. Meaning, Free monitoring. I am not sure which pins go to Arduino . I assume its the From MCU and To MCU . Can you clarify? I'm not anxious to re-look at a project I've done 6 years ago. 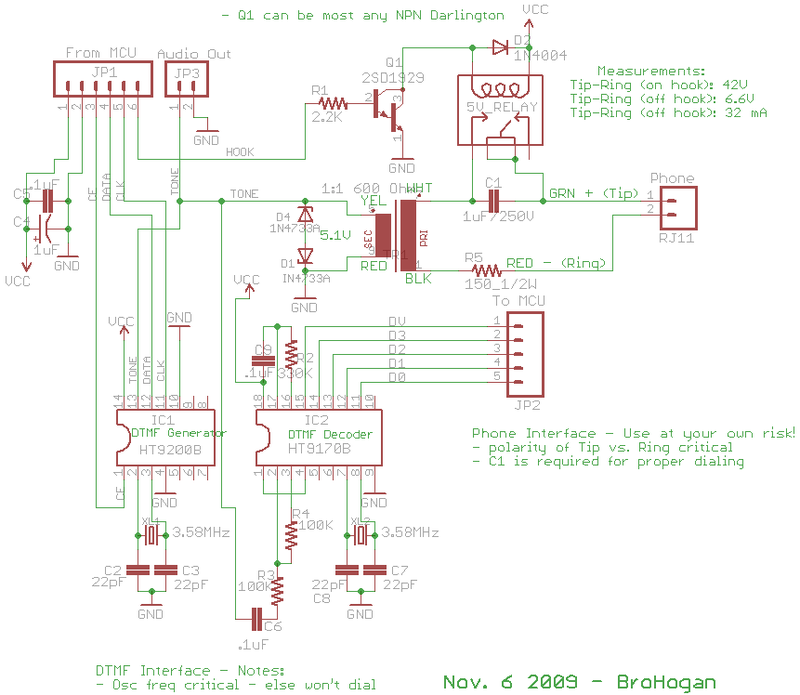 I think you can figure out which pins go where by looking at the schematic and the pin map in the sketch. I'm pretty sure I have provided all you need to duplicate this here. Then if you have any specific questions I'll try to answer them. Hi, I just want to send an audio signal using a regular telephone line locally (dont need to dial), so basically the arduino will be connected to the handheld telephone and i want to send the prerecorded audio to the phone from the arduino. Although i do want the DTMF receiver to recognize which key is pressed. Can you help me with this? Hi, how does the audio interface works? What I described here worked. But this project is so old that I'm not supporting it anymore. Sorry. You are on your own.